Unfortunately, at the time of this writing, Pepsi Throwback has already been removed from store shelves. For a limited time only, Pepsi-Co. realeased a cola that was sweetened with natural sugar. And it was delicious. Real sugar always tastes better. In any drink. Ever. High fructose corn syrup isn't a viable substitute. Natural sugar just breaks down quicker and cleaner than corn syrup during the consumption process. I was afraid to try Pepsi Throwback, because I was afraid that it would ruin regular Pepsi for me, which is exactly what it did. I am hoping that Pepsi-Co. turns it into a regular "limited edition" product like the McRib at McDonald's. Anyway, the drink itself. 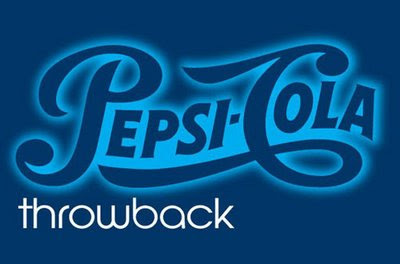 I was going to talk about my frustrations with the name "Pepsi Throwback" and it's connotations, but that could quickly turn into a long, long discussion. Maybe some other time. Anyway, the drink is pretty much perfect. The drink is a different kind of sweet than regular pepsi. It's a sweet that dissipates towards the end of every drink (as you swallow it), and it does not leave too much of an aftertaste. Throwback sustains well, as I have not only not had any trouble finishing a serving of any size, but I also find myself falling into a sort of depression as I reach the bottom of the can or bottle. Bottom line: this drink is very good. Pepsi got a lot of good response about it, and seeing as I have a hard time drinking normal Pepsi again (and I am sure I'm not the only one), I think that it would be wise of Pepsi to consider turning this into a standard (or at least annual) product.